Trails End Mountain Home, Sleeps up to 19! Year Round - Next to Y.N.P. For lodging near Yellowstone, the Trail’s End Mountain Home is the ideal location just a half mile from the Yellowstone National Park West Entrance and walking distance to West Yellowstone restaurants and shops. And because it offers lots of gathering space for groups of up to 19, it’s perfect for family reunions or corporate retreats! 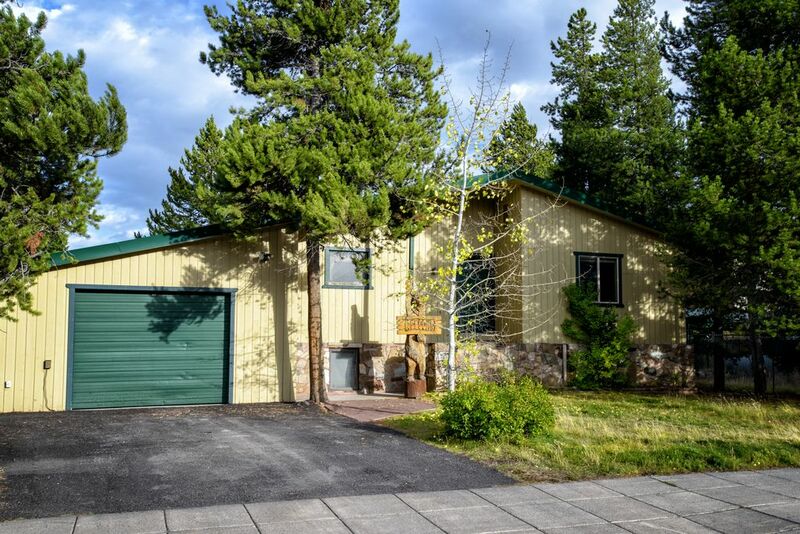 Situated on a quiet street, this mountain home is adjacent to the Town Park and the Big Sky snowmobile trail – which is also great for hiking, biking and ATV’s in the spring, summer and fall. This property features a well maintained lawn and a fenced in back yard with two picnic tables and a large gas BBQ grill, 7 large bedrooms with hand crafted log beds, a heated garage in the winter, plus extra storage space for all your things! The Yellowstone area is a very diverse vacation destination. It's the perfect place to experience a memorable family or group vacation! * All new stainless steel kitchen appliances & 2 coffee makers! West Yellowstone is surrounded by beautiful mountain views, and is the home of the West gate of Yellowstone National Park. The gate to the park is only blocks away from the Trails End. Lovely log table and matching chairs to seat ten. You can cross country ski & snowshoe right here in West Yellowstone. And downhill skiing & snowboarding are a fun day trip to Big Sky, just 45 minutes away. Located at the end of the street at the edge of West Yellowstone on one side, Gallatin National Forest on other. Snowmobile and XC ski trails right out side your door! One half mile to Yellowstone National Park. Town Park play area across the street. Great place right across from groomed snowmobiling trails. Plenty of parking for all our trucks and trailers. Having the garage for staging and a place to leave all the winter clothing is perfect. Spacious rooms to spread out never felt crowded, except when we tended to gather in the kitchen. We had 18 of us and there was plenty of room. This place worked perfect for us two years in a row. Roomy, people easy to work with, great location. The cabin was perfect for a family reunion. We had a great time. The house had everything we needed, it was a little dirty. The property is very near to the west entrance of Yellowstone Park which is a good starting point to visit the Park. The house is clean and spacious to accommodate 14 of us. Bathrooms are clean. Group of 10 stayed here for a snowmobiling trip in the West Yellowstone area. The house was amazing, clean, and we had more than enough room. The owner is very accommodating and communication was great. We will definitely be back next year! This was a perfect place to stay. The owner was accommodating and so friendly. Beds were comfy with plenty of room to spread out the family. Kitchen table was wonderful to gather around in the evenings. Tours of Yellowstone National Park, pick up at your door! Please note: the off season rates do not apply to holiday seasons. Feel free to contact the owner with any questions regarding rates during these times.